Cebu Pacific Promo Fares 2019 to 2020: P399 Base Fare to some Domestic Flights! P399 Base Fare to some Domestic Flights! 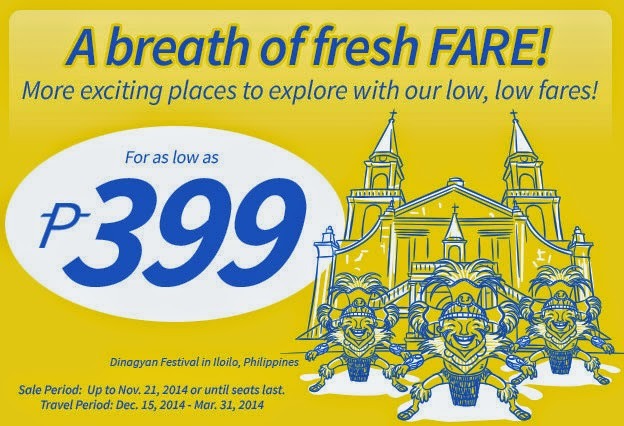 Cebu Pacific Promo Fare 2015: A breath for fresh fare! Here's the latest from Cebu Pacific. A domestic flight to start with Php 399 Base Fare going to Kalibo, Caticlan (Boracay), Naga, San Jose, Tuguegarao, Virac, Iloilo, Bacolod. All details below. *Only for flights coming from Manila/Cebu, exclusive of Fuel Surcharge ranging from Php 200 – Php 450 and Php 15 Aviation Security Fee for flights exiting from/transiting in Cebu. Quoted DOMESTIC one way fares are inclusive of Base Fare, Php 120 Web Admin Fee, 12% VAT, Php 200 Manila/Php 220 Cebu for flights transiting in or exiting from Manila/Cebu respectively, and 7 kg hand-carry baggage allowance, but exclusive of Fuel Surcharges ranging from Php 200 - Php 450, Php 15 Aviation Security Fee for flights coming from Cebu and check-in baggage. Terminal Fees ranging from Php 50 - Php 200 for flights originating from non-Manila/non-Cebu Stations must be paid at the airport. Quoted INTERNATIONAL one way fare is inclusive of Base Fare, Php 120 Web Admin Fee and 7 kg hand-carry baggage allowance but exclusive of Php 550 Terminal Fee, Fuel Surcharge ranging from Php 1,125 – Php 5,400, Php 1,620 Philippines Travel Tax, Country-Specific Taxes ranging from Php 420 – Php 2,195 and check-n baggage. Promo fares have limited availability and are non-refundable but rebookable subject to the following rebooking fees: Php 1,200 for Domestic destinations, Php 2,000 for Short-haul International destinations Terminal fees and P2,500 longhaul international destinations plus fare difference. Please note that booking fee rates range from Php 120 - Php 200 depending om purchase channel. For Your convenience, flight changes, availing of prepaid baggage allowance for check-in baggage and web check-in service can be done up to 4-hours before schedule flight. Call (02) 70-20-888 in Manila, (032) 230-88-88 in Cebu or 5 and check -in baggages. visit the travel agent near you. walang promo for april 2015? Hi, Thanks for inquiring. Promo fares are limited to selected destinations for now but don't worry more seat sales are coming, so stay tuned for those, just keep checking this page as we announce seat sales here. Pls. refer to the above post po. you may please do a mock booking po thru cebupacificair.com and mind the travel dates of the promo or visit any nearby ticketing office or agency or call these nos. for inquiry: Call (02) 70-20-888 in Manila, (032) 230-88-88 in Cebu.Thank you. gandang hapon po,,wla po bang promo ng manila to mindanao en nindanao to manila,,for month of dec to feb? Meron po bang cagayan-manila roundtrip? Paano po mavpareserve ng ticket? Hi, Thanks for inquiring. To reserve, kindly visit cebupacificair.com and mind the travel dates of the promo or visit any nearby ticketing office or agency or call these nos. for inquiry: Call (02) 70-20-888 in Manila, (032) 230-88-88 in Cebu.Thank you. Pag tuguegarao to boracay?how much evrything po? Hi, Thanks for inquiring. There is but we cannot give you exact amount, as fare rates will depend on the date and time of your flight or you may please do a mock booking po thru cebupacificair.com and mind the travel dates of the promo or visit any nearby ticketing office or agency or call these nos. for inquiry: Call (02) 70-20-888 in Manila, (032) 230-88-88 in Cebu.Thank you. Piso fare promo please. Manila to Singapore. I want to celebrate my son's bday in Singapore on January 6 2015. Please... Tnx! Kelan mgkkrun ng promo piso fare april or may 2015?? Pls!! Pls!!pls!! Magkano po aabutin ng tug to manila round trip? May promo po ba for Feb 2015 mnl-bangkok? do you still have available promos for December trip of this year( December 20, 21 ,22, 23 ) trip destination from Tacloban to Manila? Kanu po ung mindanao to manila reply pls.pls.pls.pls.. kaht walang promo. How about bacolod to manila? For December or summer? May promo po ba sa January 2015? pwede po bang from cebu to pagadian or ozamis flight? Gudam po..inquire q lng po qng mgkanu roundtrip ng manila to dumaguete Jan.5 to Jan.12.. khit anung oas po. May promo po b this may 2015 dated 21? hellow po ,, may promo po ba kayo this coming dec.20-23 round trip 5adult and 1 child manila to cagayan de oro ..
Manila to dumaguete departure September. Magkano po? CEB Advisory - Tropical Depression "Queenie"
2015 Promo Fares Jan to Mar!